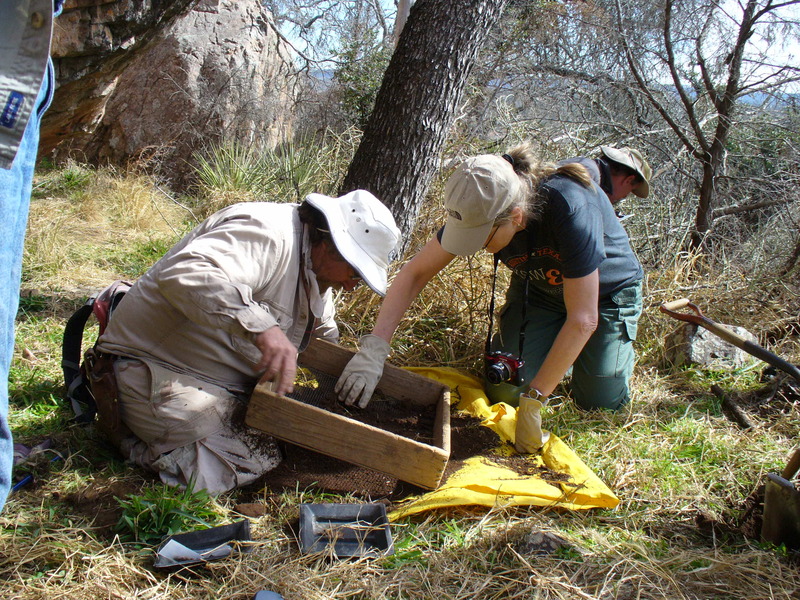 If you never thought you’d spend a day looking for flakes, you’ll get a whole new appreciation for that term after spending a day in the field with folks from the Llano Uplift Archeological Society (LUAS). On a beautiful February morning, we hiked up the peak at Reveille Peak Ranch, and found history under a rock overhang. 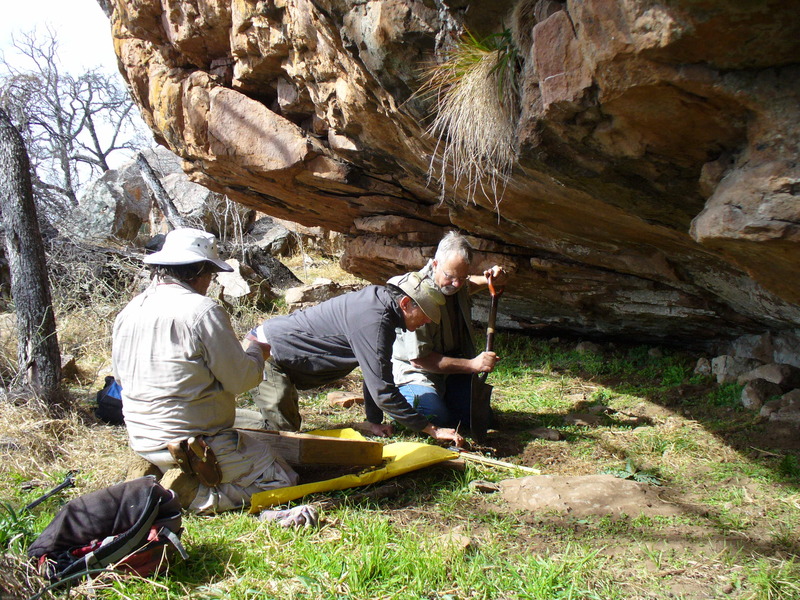 Noting the site location on their GPS, the team dug holes, carefully measuring the dig levels as they went. They quickly uncovered debitage, small flakes of stone, which indicated that someone had inhabited this area and had made tools at this location. The tools might have been scrapers used to skin animals or points for projectile devices. This technique is called knapping and flakes are a bi-product of that process. So, finding flakes is a good thing! Sifting for a bit of history. 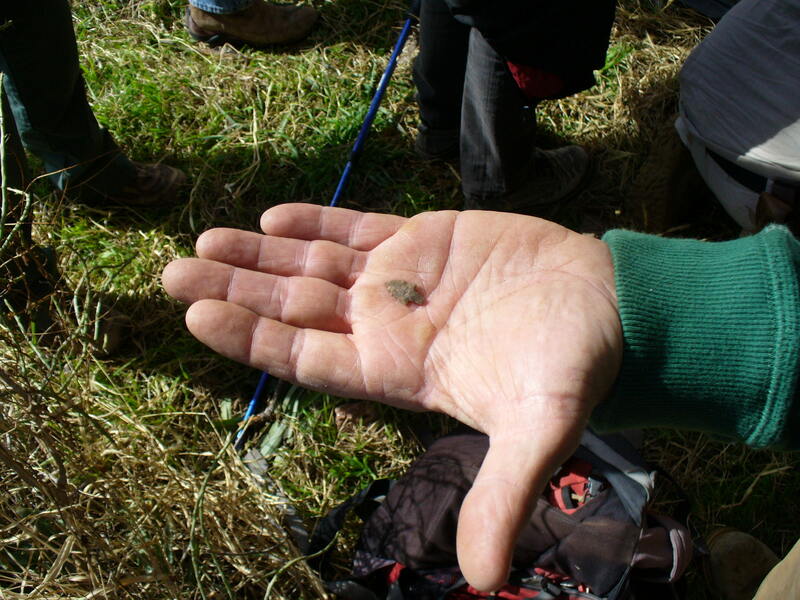 We also found pock-marked chips that gave evidence of stones that had been heated to make the shaping easier. It was hard to drag the scientists away. Their hard work was rewarded with a number of interesting artifacts that will be showcased in the new Nature Center building scheduled to be completed later this year. To give you an idea of how eagle-eyed and diligent these scientists are, we’ll close today’s post with a photo of a tiny projectile point, a Perdiz point (called a bird point ). These were in use 700 to 800 years ago or younger to 300 years ago (about the time the Spanish were coming through). We also found pieces of Nolan points (Atl Atl point) which were in use 4500 years ago (about the time the pyramids were being built). What an amazing day! Previous PostNew homes ready for our Bluebird friends.Next PostSigns of spring, finally! Do you have a plant list for your property? I have created one for a new piece of property I bought on Hamilton Creek just east of Marble Falls and could really use a comparison list to help me. Thanks for what you are doing out there. I’d love to come and visit. We have a plant list for the demonstration gardens (monarchs, pollinators, keyhole), and I’m checking to see if we have a plant inventory for the ranch. I’ll send both to you as soon as I receive them. To arrange a visit, use the contact for to send in a specific request. Since we are volunteer driven, we typically require a group of 15 or more to schedule a visit. However, there are a number of groups already scheduled to come out this spring, such as the Kingsland Garden Club who will be visiting us in a couple of weeks. You might want to tag along with them.